Tickets for Storm’s upcoming “Winter Classic” game against Sheffield Steelers today can be ordered online HERE, by calling the Box Office on 0161 926 8782, or in person at the box office. We are down to very limited tickets, if you’re looking to book two or more seats, please book in 101, 102 and 111. Tonight sees your Go Goodwins Manchester Storm host their traditional New Year’s Day game against visitors, Sheffield Steelers. Join us this evening for a 17:30pm face-off, as the two teams look to secure two points in this EIHL matchup. 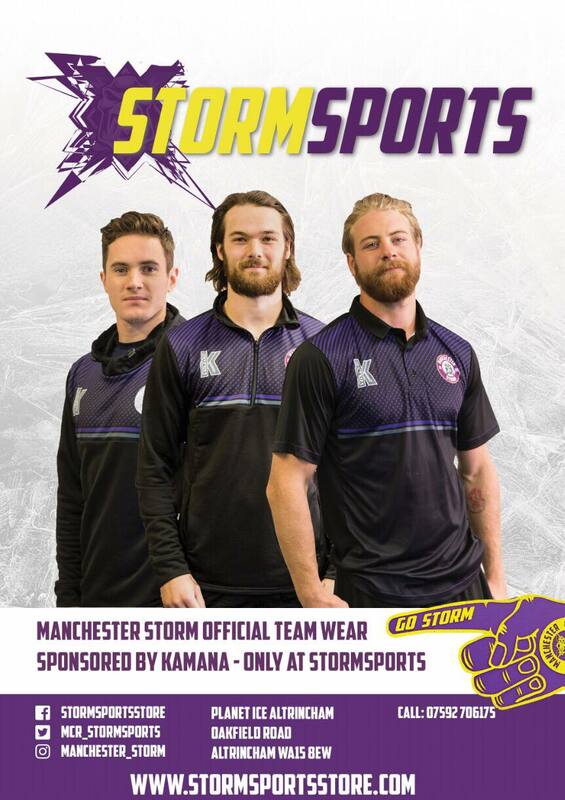 In this special themed “Winter Classic” game vs old rivals Sheffield Steelers, the Storm players will be icing in retro themed jerseys, to mark Manchester’s hockey heritage, dating back to the early 1900’s! You can read more about Manchester’s hockey heritage here. The jerseys will then go online via Storm Sports Store from 2nd January at 5pm, signed by the player who wore it for £150. There will also be two blood jerseys available for £100. Tonight is also netminder, Declan Ryan’s final game. Declan has been been signed to the Storm for the past two seasons, and is both a product of youth hockey in Altrincham, also being a huge part of fellow team, Altrincham Aces. It’s time to say a bittersweet goodbye, as he looks forward to new beginnings with his career in lecturing. We are sure he won’t be a stranger in the Storm Shelter and the club wishes him the best of luck with his new career! It was only last Saturday 29th December that Storm and Steelers faced each other, away at the FlyDSA Arena. The game was thrilling from beginning to end, with ten goals overall, the EIHL’s current leading British player – Ciaran Long, getting two of Storm’s four goals. The game was a close one throughout, and Storm will be doing everything they can to claim two points on home ice this evening. Tonight is looking to be a complete sell-out! We would like to thank everyone who has purchased tickets and we look forward to having you in the Storm Shelter. Be sure to turn up with plenty of time. In order to avoid disappointment please book the few remaining tickets online. Ticket information can be found here, please book 101,102 and 111 if you’re looking at booking for more than two seats together. There are limited seated and standing tickets left. We hope you all had a Happy New Year! The club looks forward to welcoming everyone into the Storm Shelter for tonight’s game. Why not join us for The Storm’s next home game, as we face visitors – The Nottingham Panthers, 6th January, 17:30 face-off. The Club’s second Skate with the Storm event of the season will be held tomorrow on 2nd January, 9:15-10am! It’s free with your own skates or just £2.50 for skate hire. The cafe will be open for those wanting hot drinks. This is a perfect opportunity to bring your family and get photos and signatures with your favourite players. HIGHLIGHTS: STORM WIN WINTER CLASSIC!